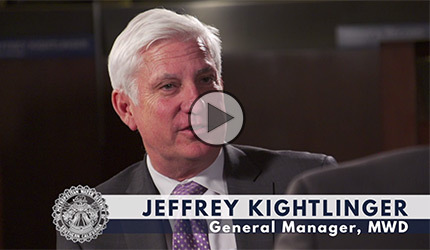 Metropolitan General Manager Jeffrey Kightlinger talks about 2017 accomplishments, including conserving 1 million acre-feet of water, record rainfall, Lake Mead storage and a partnership with the Coachella Valley. View the video. In January, the California Department of Water Resources will hold two California WaterFix workshops for small business and disabled veterans business enterprises. These events will include an overview of procurement and contracting opportunities associated with California WaterFix and provide small businesses the opportunity to network with prime contractors pursuing the RFPs/RFQs. The first workshop will be in Sacramento on Jan. 9 and the second will be in Carson on Jan. 11. Read more and register now. Due to the recent Santa Ana winds, Diamond Valley Lake closed on Dec. 7 as 7-foot swells created dangerous conditions for boaters. The lake reopened the next day. As fires swept through Southern California, Metropolitan's Jensen Water Treatment Plant lost power, forcing it to go on emergency power temporarily. There were no other impacts to Metropolitan facilities. View video of the lake. The Second Lower Feeder is one of the major pipelines in Metropolitan's distribution system. 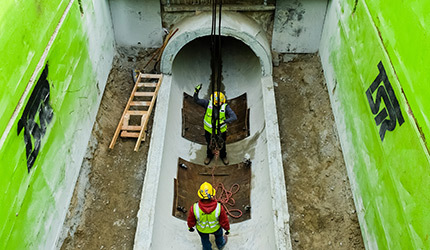 Constructed in 1967, it delivers treated water from the Diemer Water Treatment Plant in Yorba Linda to the Palos Verdes Reservoir in Rolling Hills Estates. Approximately 28 miles of this pipeline need to be relined with steel to ensure that it will be reliable long into the future. The construction will be phased over a period of 8 to 10 years. So far,1,600 feet of pipeline has been relined in Long Beach, and excavation recently began in Lakewood. Read our project fact sheet and view a video. Metropolitan's award-winning conservation campaign was launched in 2015. 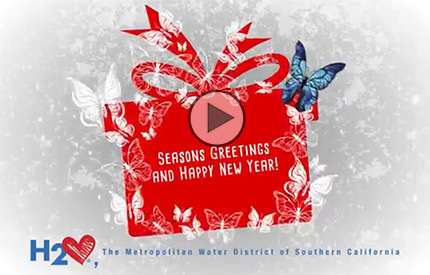 In November, Metropolitan's Board authorized staff to initiate a request for proposals for a new $14.7 million, three-year, multi-media water conservation advertising and outreach campaign. All proposals are due Jan. 11. View a recap video of our past conservation campaign. Above, winners featured in the student art calendar celebrate with several member agency board members and mascots. In December, students who live in areas served by Metropolitan's 26 member agencies, gathered to celebrate their water art, which will be featured in the 2018 "Water is Life" calendar. A final selection of 36 art submissions are featured in the calendar, which has an annual distribution of 11,000 recipients. View more photos from the event. Teams of high school students from five Southern California counties spent a Saturday in December at a Solar Cup™ Technical Workshop. The students heard from award-winning filmmaker Sascha Rice and learned more about developing their technical reports and conservation-themed social media. The Solar Cup™ competition is May 18-20, 2018 at Metropolitan's Lake Skinner in Temecula.